While the boxing world got all emotional about Muhammad Ali and forgot that their sport is all about one human being inflicting physical damage on another, the less admirable side of it all was alive and well and living England. If Ali represented all that was good about boxing – much of it based, strangely, on the man’s intelligence – Tyson Fury has shown what sheer brute strength can achieve, and it’s not a pretty picture. That is not to say that Fury is unintelligent; he has a way with words that can make the most idiotic pronouncements sound almost credible. He may be prejudiced, bigoted, small-minded and dumb enough not to notice until it is pointed out to him, but he has things to say. And in this quote-hungry world, to some observers that is better than silence. 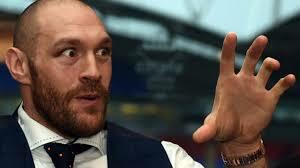 Disregarding the emerging story of a dodgy drug test, what Fury has done to bring the sport into disrepute is to declare that becoming world heavyweight champion has made him rich and that’s what it was all about. Now he feels he has nothing to prove, nothing left to achieve. He is happy to sit in front of the media and grab rolls of fat around his middle to demonstrate that he is in fact an overweight slob rather than a finely-honed athlete. 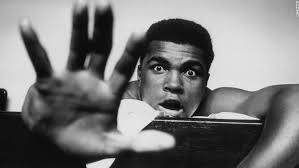 And he uses this to laugh at Wladimir Klitschko, whom he beat in the contest to become the world’s most fearsome man. But if he laughs at Klitschko, he laughs at the world; he laughs at all of us for being naïve enough to think he was a sportsman. The rematch with Klitschko has been delayed, supposedly because of an ankle injury, but what that is doing is robbing us of the pleasure of seeing Fury humiliated by the former champion, whose mojo will hopefully have been restored by his sudden casting as the hero. Only the most blinkered and leaden of thinkers can be rooting for Fury now. Lovers of sport in all its many forms are willing Klitschko on, desperate for him to shut Fury up once and for all. Not that that is going to happen, of course. Because Fury has an answer for everything, and the perfect excuse for losing this time: he’s done it, achieved what he set out to achieve, and no one can take it away from him. His name is in the record books. The monolith from an Irish traveller background, son of a bare-knuckle fighter, has scaled the only peak available to him and if he is knocked off it straightaway, so what? The money is still in his bank and the title that defines him just gains one word: former heavyweight champion of the world. If it seems uncharitable to hold views such as these, let’s just say it is the only language Fury currently speaks. To look into his future is to imagine a spiral of decline, where the money disappears, the friends and family fall away and he hits rock bottom with only his wit and bravado functioning. And then he can reinvent himself, perhaps as a man dedicated to helping unfortunates such as himself to make a living with their fists. Or perhaps religion will present itself as a secondary career, because someone with such a huge ego couldn’t keep it to himself. A far more admirable fighter, former middleweight champion Nigel Benn, found God once his boxing days were over, albeit without the drama that somehow seems inevitable in Fury’s hypothetical demise and rebirth. So let’s get on with it. Over to you, Mr Klitschko, to set the ball rolling.